Also winner of Best Overall Bar in the city, the food, drinks and overall vibe of Southern Railway Taphouse seems to resonate with Richmond bar goers. General Manager Robert Peters notes this grab bag of reasons when talking about the bar’s consistent success. 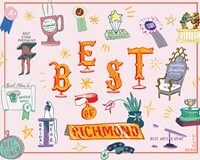 “I feel we have the best staff and best food in the city of Richmond and everything is at a reasonable price,” Peters says. “It’s a great place to socialize and meet people. And everything from our beverages, to our service, and our delicious food makes Southern Railway a great destination spot.” Judging by the votes, many people have made Southern Railway Taphouse their destination for lunch, happy hour and late night.